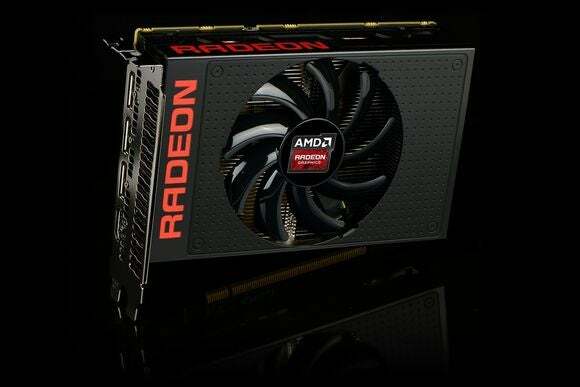 There's no other graphics card quite like the AMD R9 Nano, which packs full-size performance into its six-inch frame—but it's not for everyone. AMD deserves some serious props for even creating the Radeon R9 Nano in the first place. This pint-sized powerhouse is the latest in a long line of AMD technical innovations that skate to where the puck is going, rather than where the puck is lingering today. Built around revolutionarily tiny—and fast—high-bandwidth memory, the six-inch Radeon R9 Nano delivers flagship-level performance in a form factor that fits where most other graphics cards simply can’t. The Radeon R9 Nano inside a Lian Li mini-ITX case. In an age where graphics cards keep expanding with heat pipes and heat sinks and fans in order to push performance to 11, the Nano’s more holistic design approach is a breath of fresh air, dragging mini-ITX (mITX) graphics cards out from the shadows and into the spotlight. It truly feels forward-thinking—the first top-tier graphics card designed for a future where mainstream computing increasingly shifts towards NUCs and Steam Machines and small-form-factor designs and PCs-on-a-stick. There’s no other card out there like quite it, and the Nano will bring tremendous joy to the people pining for its particular blend of high-end features. But pushing the PC ecosystem forward isn’t possible without some growing pains. The $650 Radeon Nano rocks, but it won’t appeal to everybody—not by a long shot. The $650 asking price for the Radeon R9 Nano shocked some people, but AMD’s deft design of the Nano goes a long way toward justifying the flagship-level cost. This is the most powerful mini-ITX graphics card ever created, and every aspect of it screams premium. And it’s downright puny compared to the hulking Asus Strix Fury. The Fury is AMD’s other air-cooled graphics card built around a Fiji GPU and cutting-edge high-bandwidth memory. Here’s a picture of the Radeon Nano next to a pencil and a battery for yet more scale. The Nano takes its design cues from AMD’s other flagship, the also $650, water-cooled Radeon R9 Fury X. The Nano features a black metal shroud with a soft-touch aluminum finish, with RADEON emblazoned in bright red across its front and outer edge. 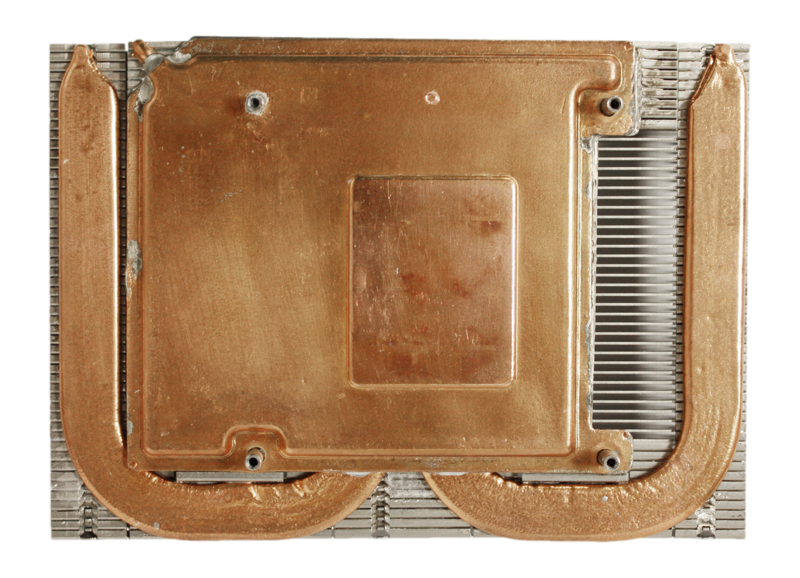 It lacks a backplate, however, and for cooling it sticks to a single fan integrated in the shroud, sitting atop a card-length heat sink with horizontal fins. 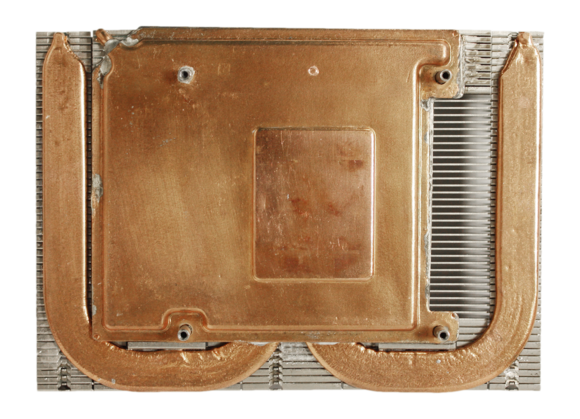 The GPU itself stays chilly thanks to a hybrid flattened-heatpipe/vapor-chamber solution. There’s even a dedicated copper heatpipe just for the Nano’s voltage regulator module. Now that’s a cooler. The Radeon R9 Nano’s cooler, to be exact. Our deep dive into the Nano’s design shines even more light on its inner workings, but the important part is that the cooling setup works well, as you’ll see once we wade into benchmarks. That’s a good thing, because AMD says customized Nanos from its graphics vendor partners (like Asus and Sapphire) won’t necessarily be available. If they ever are, it’ll be at least three months after launch—and even then, third-party vendors won’t be allowed to touch the GPU’s base specs. Speaking of which, those specs are no joke. 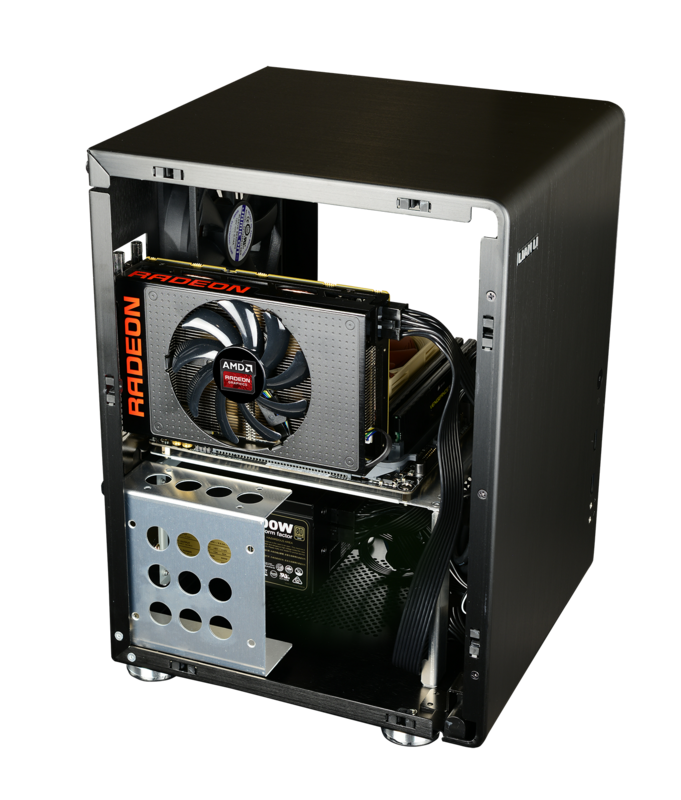 The Radeon R9 Nano packs the same full-fat, 4096 stream processor-strong Fiji graphics processor as the Fury X, along with the same 4GB of HBM. The Nano’s GPU isn’t an exact mirror of its bigger sibling, however: In order to squeeze Fiji into a mITX form factor without liquid cooling, AMD reduced the clock speed of the Nano’s GPU enough to allow the card to consume a mere 175 watts of energy over a single 8-pin power connector. The Fury X, on the other hand, requires two 8-pin connectors and 275W. 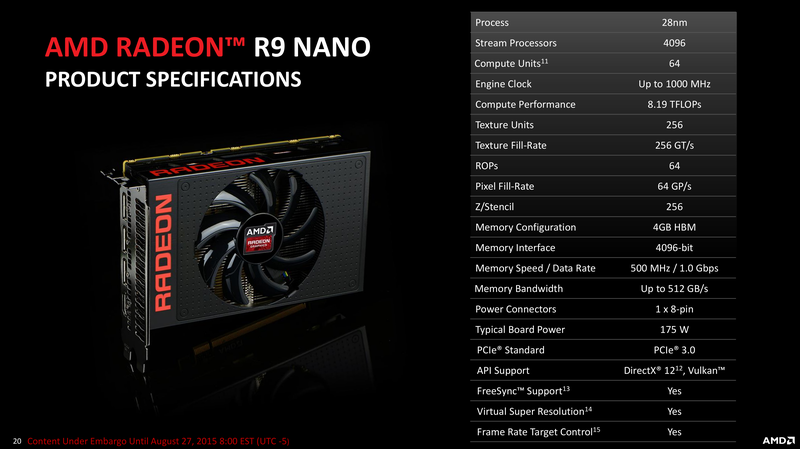 The AMD Radeon R9 Nano’s specs. There’s more to it than the listed specs, however. On paper, the Fury X is clocked at 1050MHz, while the Radeon R9 Nano hits up to 1000MHz—but the Nano uses an aggressive version of AMD’s PowerTune technology to dynamically adjust the clock speeds to meet the card’s thermal and power targets. Observing real-time clock specs for the Nano using GPU-Z, it ran at 650MHz to 680MHz in the Furmark benchmark (which both AMD and Nvidia call a “power virus”), typically 859MHz to 926MHz in 3DMark’s Fire Strike (though it dropped to 700MHz during the last, most stressful scene), and 852MHz to 917MHz in Middle-earth: Shadow of Mordor. That seems like a recipe for stuttering and frame rate issues, but nope: Games ran like a champ, while the card stayed cool and relatively quiet. AMD said the Nano would outpunch the older Radeon 290X flagship while using drastically less power, and spoiler alert: It does. It also drastically outperforms the GeForce GTX 970, the most powerful mITX graphics card in Nvidia’s arsenal. Heck, the downclocked Fiji GPU in the Radeon R9 Nano even trumps a full-sized GTX 980 in most cases.